Yesterday was a calm day at the feeders. 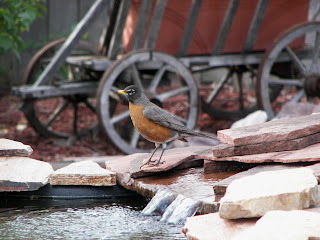 We had the usual visitors: robins, finches, chickadees and sparrows but no new sightings. We saw the Western Tanager several times in the trees - but he did not come into the yard. I think I spotted the female tanager once - but I'm not sure. The squirrels must still be mad at us - as they kept their distance and did not even try to get to the feeders. I saw a House Wren the other day and want to encourage them to stay so we put up the wren house we bought at "This Place is for the Birds" and Bill built two more. We mounted them near the top of our 6-foot fence on the south side of the backyard. I also put out nesting supplies - feathers, cotton, string and straw. Bill says we need to put a "For Rent" sign up and offer the first month free. In the afternoon we went south to Pueblo to the Wild West Festival at the River Walk. It was very nice - but I was uncomfortable walking too far as I have a bum knee that has been bothering me lately. I had an MRI last night and should know on Monday if I need surgery or can fix it with physical therapy. After a great lunch, we drove through the Pueblo Reservoir State Park. 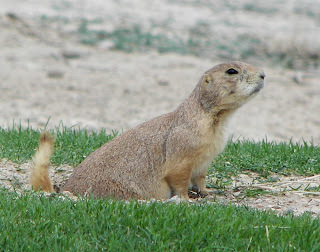 The Prairie Dogs were everywhere. They carry Bubonic Plague and have to be eradicated every now and then - but seem to be holding their own anyway. 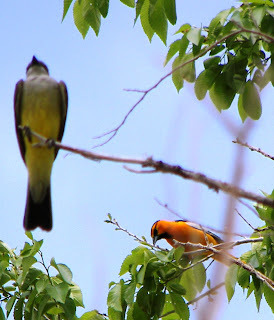 I spotted this yellow bird in a tree, went to take a picture - and noticed this orange bird in the background. 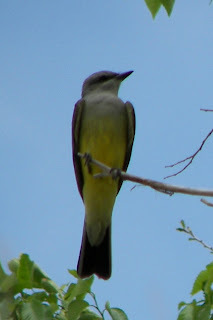 The yellow-bellied bird appears to be a common Kingbird. We have the Western variety in Colorado, but they don't have notched tails like this one - so it looks more like the Tropical variety - or an interbreed of the two. Maybe I've just mis- identified it altogether. 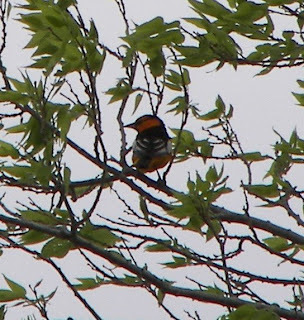 The beautiful bright orange, black and white bird is a Bullock's Oriole - very similar to the Baltimore Oriole found in the east. This morning we made our usual Saturday morning trip to Einsteins for coffee. We have a regular group we meet there - Joe & Nancy, Lucy & Mike, Tom & Valerie, Sal and others. As friends arrive - we just move more tables together until we've taken over one side of the restaurant. It's always a great time as we visit, joke and drink lots of coffee. Some of the people we've met there have become good friends.